Brownie’s Auto Repair has been servicing vehicles for over 67 years in Walkersville, Woodsboro Libertytown and Frederick, Maryland. Brownie’s was started by Charles Brown (Brownie) in 1947. Brownie’s Auto Repair is today owned and operated by Michael Blue. 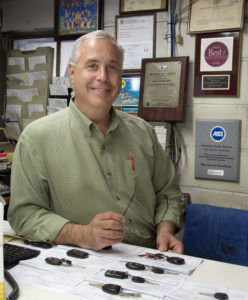 Mr. Blue purchased the business in 1987 and is only the second owner of this successful auto repair shop in Frederick County, MD. Brownie’s Auto Repair continues to provide excellent auto services for most vehicles and light trucks. State of the art equipment and properly trained and experienced technicians have made Brownie’s Auto Repair a trusted auto repair business. Brownie’s Auto Repair serves all of Walkersville, Woodsboro, Frederick, Libertytown, and surrounding communities with the highest quality auto repair services.